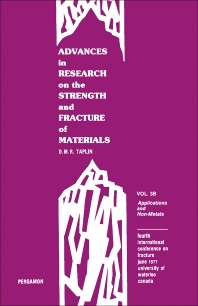 Advances in Research on the Strength and Fracture of Materials: Volume 3Bs—Applications and Non-Metals contains the proceedings of the Fourth International Conference on Fracture, held at the University of Waterloo, Canada, in June 1977. The papers review the state of the art with respect to testing of fracture in a wide range of non-metals such as ceramics, glass, composites, polymers, biomaterials, and concrete. This volume is divided into five sections and opens by discussing the role of acoustic emission in fracture toughness testing and the relation between static and dynamic fracture toughness of structural steels. The reader is then introduced to methods for determining stress-intensity factors of simplified geometries of structural parts; stress analysis of pressure vessels by thermal shock; the fracture toughness of constructional steels in cyclic loading; and fracture processes and fracture toughness in powder forged steels. The remaining chapters explore the influence of low-cycle damage on fracture toughness; fracture of structural alloys at temperatures approaching absolute zero; fracture mechanisms in Si-Al-O-N ceramics; propagation and bifurcation of cracks in quartz; and the effect of pressure and environment on the fracture and yield of polymers. This monograph will be a useful resource for metallurgists, materials scientists, and structural and mechanical engineers.